This fifties James Gents bike is just the sort of old cycle I advise friends to buy if they want to start off a vintage collection. Such bikes are not expensive on the open market. You’d generally pick up one like this, needing restoration cosmetically and mechanically, as I did, for under £50. The attraction is obviously a good head-badge, full chain case, and its motorcycling connection. 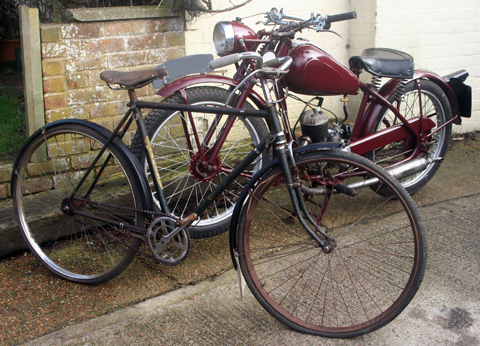 Postwar James motorcycles are very common, but James bicycles are scarce nowadays. What a joy to discover a catalogue featuring your own bicycle! Back in the day, you’d browse the catalogue to help decide which model to buy. Fifty years down the road, not knowing the age or model name of my James, I eagerly opened each page of the catalogue to see if it’s in there ….and yes it is. Now I know – It’s the 1958 James Ambassador Model J25S. 1. Buying a bicycle and discovering for the first time it’s year and model name? 2. Restoring a bike and riding it for the first time? For hobbyists like me, both events are a minor milestone. And, as philosophers have told us, minor milestones in life, when acknowledged, are much more important to us than we may realize. Little spontaneous things are what Life’s all about. Though I still have piles of literature waiting to be scanned and uploaded for you, I hope this website can help you discover new facts about your own bikes, and provide similar pleasure and enjoyment. As you’ll observe from the rest of the catalogue, they also made a ‘Comet Roadster’ which features a more modern-looking half chain-case. The Comet name is well-known for the postwar James 98cc two-stroke motorcycle. I find the old-fashioned look more appealing and so prefer the older styling of this Ambassador. I’ve reproduced a history of James bicycles elsewhere on this website. You may wonder, with other older and rarer cycles in the collection, as featured on this website, why I’ve written so much (and philosophized) about an ‘old clunker’ such as this. Thankfully I’m not alone in enjoying finding rare, but not particularly valuable bicycles. I belong to various vintage bicycle forums and clubs and I talk to other enthusiasts who share such pleasures. I think a lot of it may be about ‘rescuing’ such vehicles and bringing them back to a useful existence. I’ve always been drawn to the vintage vehicles that others pass over. This one was on ebay with a starting price of £45. I was the only bidder. Often the cost of collecting a bicycle is more than its purchase price but, luckily, this one was located only 70 miles away. The use of the Ambassador name by James Cycle Co Ltd for one of its bicycle models is interesting, as Ambassador was one of their competitors after WW2. Ambassador Motorcycles was established by the Irish motorcycle (and car) racer Kaye Don, originally in 1946 as ‘American Concessionaires Ltd’ to import American cars. Remember that postwar, new British cars were at a premium because the vast majority were exported to help with foreign exchange. From 1947 Ambassadors used Villiers two-stroke engines which pitted them directly against the similarly-powered James machines. The James models were much cheaper, however, and the market leaders in their field. Ambassadors were well-made and featured, but did not sell so well: of course, an expensive two-stroke has to compete directly with cheap four-strokes. The name Ambassador Motorcycles was incorporated in 1951. Ambassador was the UK concessionaire for German Zundapps, as you can see from the 1956 advert above. In 1962, DMW bought the Ambassador factory. The Ambassador moped came out in the same year. Ambassador Motorcycles ended production in 1964. As Ambassador did not make bicycles (obviously why James got away with using the name), I’ll keep an eye out for one of these rare mopeds to restore: an Ambassador moped and bicycle would be an interesting pair. I really enjoy the writings of Mark Daniels. To my mind, he’s our top British automotive journalist. (I’m biased because I really enjoy the subject of his articles as well as his style). One of his articles on an obscure vintage moped or cyclemotor undoubtedly becomes an integral part of that vehicle’s history because he brings it to life just as we would by restoring, running and riding it for the first time. You can read his road test of the Ambassador moped on the Moped Archive by CLICKING HERE. To conclude this page on the James Ambassador, here are two adverts (thanks to Sheldon) for a 1950 Ambassador 197cc motorcycle and a 1961 Ambassador scooter. Well, just to prove the point made above about the lack of popularity of fifties bicycles requiring restoration, I tried to purchase a stablemate for the James Ambassador Gents when it appeared on ebay. I left a bid on it without thinking it would be enough, and bought it for less than expected, for the grand sum of £17 55p, plus £35 shipping. Unfortunately the seller never sent it and, after two months waiting, I gave up and obtained a refund. Coincidentally, in 1958, the Comet Roadster’s sale price was £17 15/- which is only 20p (or 4 shillings) more than my 2009 purchase price. Although, according to the brochure below, an extra 6/- 8d was required if the bike had a Lincoln Green finish, as this one seems to have. So this bicycle has actually lost around 50p in value over its 51 years of existence.